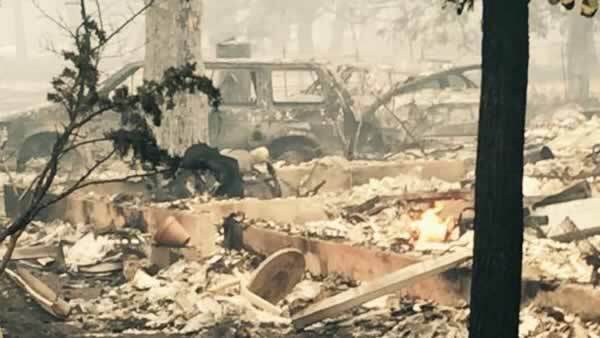 The Valley Fire burning in Lake and Napa counties prompted the evacuation of more than 17,000 people. The American Red Cross has a shelter in place at the Calistoga Fairgrounds. ARC is reporting it cannot accept bedding, clothing, etc., for that location and would rather push donations online. List of donation centers (nonprofits, businesses and individuals) who are dedicated to helping the Lake County fire relief effort. There are so many lost pets and animals that a Facebook page has been set up to help. Calistoga shelter is inundated with #ValleyFire donations. Moving forward, please donate funds online @RedCross to http://t.co/NNV70d3VKR. We are humbled by the many offers to donate foods and supplies for #ValleyFire. We have what we need to shelter, feed & clothe the evacuees. The annual Calistoga Harvest Dinner will now move indoors and donations will be taken for the Valley Fire victims. At the Calistoga fairgrounds, they have partnered with Petaluma Animal Services to care for the evacuated pets and animals. They are asking for donations of food for displaced animals to be brought to Calistoga Cal Mart and Safeway in St. Helena. Wine County Animal Lovers is coordinating donations for animals. You can donate by clicking here.